Founded in 1950, Dunkin’ Donuts has become the world’s leading baked goods and coffee chain, serving more than three million customers around the globe every day. 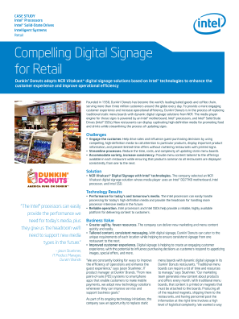 To ...provide a more engaging customer experience and increase operational efficiency, Dunkin’ Donuts is in the process of replacing traditional static menu boards with dynamic digital signage solutions from NCR. The media player engine for those signs is powered by an Intel® motherboard, Intel® processors, and Intel® Solid-State Drives (Intel® SSDs). Now restaurants can display captivating high-definition media for promoting food and drinks while streamlining the process of updating signs. • Engage the customer. Help drive sales and influence guest purchasing decisions by using compelling, high-definition media to call attention to particular products, display important product information, and present limited-time offers without cluttering restaurants with printed signs. • Streamline processes. Reduce the time, costs, and complexity of updating static menu boards. • Accommodate variety, increase consistency. Provide menu content tailored to the offerings available in each restaurant while ensuring that products common to all restaurants are displayed consistently from one to the next. Read the full Delivering Compelling Digital Signage for Dunkin’ Donuts Case Study.